Hello great state of Oregon! It seems I have another two-fer that is the product of mere chance and good fortune. 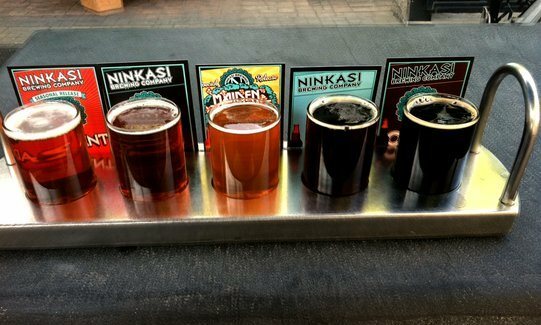 Recently, my local beer store began carrying some of Ninkasi’s product line, and given that I’ve seen it around several of my other haunts, I decided to give it a spin. In the past week, I’ve tried two of their regular lineup, a double red and an IPA, and was pretty impressed with both. First up, the Believer Double Red Ale. As I said before, I was quite impressed with this first installment from their lineup. Immediately I noticed the interesting floral and sweet bouquet, which was also present in their IPA. And the flavor was consistent, delivering a hop flavor that smacks of your traditional Centennials, plus the Summit variety which are largely used in Barley Wines (another aspect that is apparent from the get go). Combined with a deep, rich malt profile, this beer packs a bit of a double-whammy. It begins with a deep malty taste that is slightly sweet and syrupy, also reminiscent of barley wine, and a complex hop flavor that’s both citrusy and grassy. The flavor then transitions where the malts and hops deliver in the aftertaste department, becoming coarse and bitter respectively. Second, there is the Total Dominion IPA. Of the two, this was my favorite, though only by a small margin. Much like the Believer, it is a complex beer boasting a good strength (6.7% compared to the red ale’s 6.9% alc/vol) and a combination of hops that lend it a distinct aroma and flavor. But unlike the Believer, it is lighter in terms of appearance and malts. Light in color, relatively light in malts, the main thrust of this customer comes through in the hops. Rated at 85 IBUs, its no secret that this IPA has a bitter hop profile! However, said profile has many layers to it and this is noticeable in the smell as well as the taste, consisting of Summit (once again), Amarillo and Crystal hops. In terms of taste, this results in a citrus bite, followed by notes of tropical fruit (I detected passion fruit and pineapple), followed by a long, lingering bitter finish. Not a bad start for this operation, located in Eugene, Oregon and not far from where my sister and brother-in-law live. Perhaps I shall arrange for that road trip sooner other than later 😉 And that’s all for now. One of these days, I really MUST find the remaining beers on my winter list and polish that long document off! Otherwise, I’ll be transitioning into Spring seasonal beers before I ever complete it. How humiliating would that be? There are few things more appealing and comforting than a good breakfast! 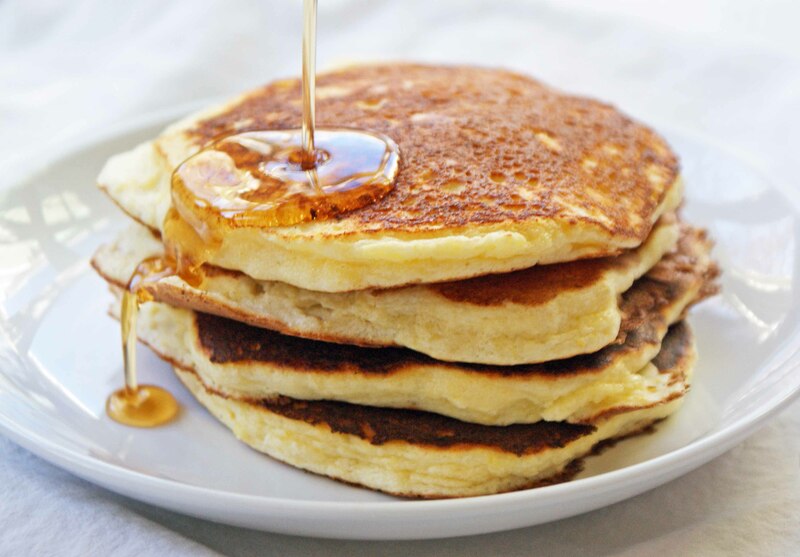 Especially when it consists of a stack of fluffy, chewy, delicious pancakes. And after tinkering with the recipe for some time, I think I’ve finally found the proper balance of basic ingredients. And so here they are, my recipe for Comfort Banana Pancakes! Naturally, bananas are a good addition to any breakfast food. But when they are softened and added directly into the ingredients, in the form of banana bread, muffins, or this particular recipe, the result is a food that has consistency, is nutritious, and where the addition of the bananas natural starches provide an extra layer of flavor that seems at once dense but light. And of course, they are versatile, going well with all kinds of condiments! Combine all ingredients into a bowl and whisk until consistent and smooth. Heat frying pan and grease with vegetable oil or cooking spray. Spoon a good-sized helping into pan and flip as needed. And when it’s time to serve, they can be enjoyed any number of ways. 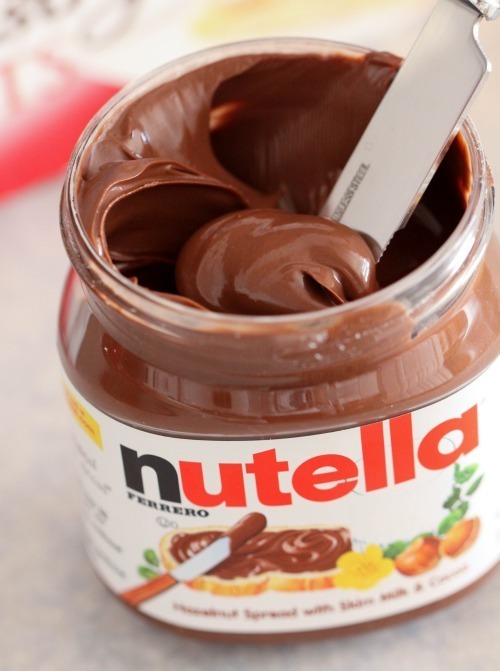 My favorite toppings include butter and maple syrup, Yoghurt and maple syrup, and Nutella and yoghurt. Feel free to sub your own repertoire of toppings, you really can’t miss! Until next time, stay warm and well fed my friends! Today, while I take a short break from my winter beer series, I thought I might publish two reviews that came pretty close together and were from the same brewery. And so I thought I’d a two-fer on the Salt Spring Island Brewery, which is, I have to admit, a craft brewing operation I have not sampled from for awhile. So it’s fitting that I found two of their newest products at my local beer store recently and decided to partake. These would be the new Snug IPA and Whale Tail Amber, respectively. Both were fine products and indicative of their dedication to quality and organic ingredients. Basically, they are what one would expect from a Salt Spring Island operation. 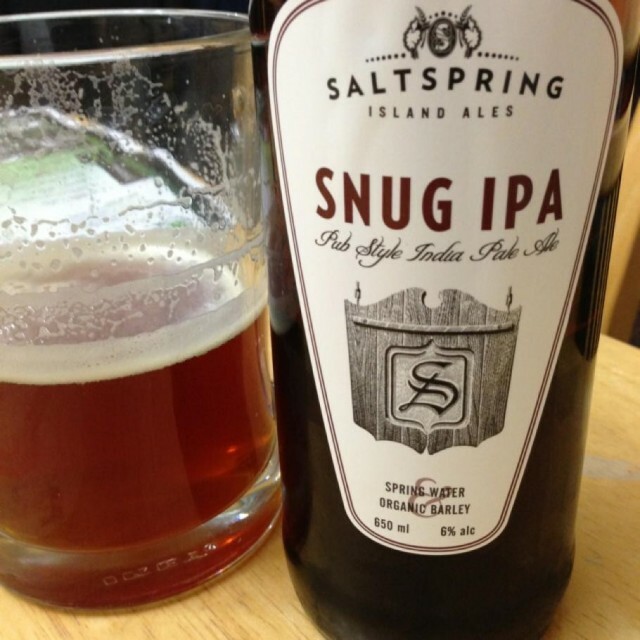 First up, their Snug IPA. Much like their other beers, I found this one quite light and smooth, entirely inoffensive, but still in keeping with what an IPA is all about. This included a strong, citrus profile indicative of cascade hops and a smooth, slightly sweet taste that’s telltale of crystal malts done right. And of course, it has a nice bitter finish, as any IPA worth a damn should! All around, a good balance of malt and hops and an overall clean character. Definitely a repeat purchase. 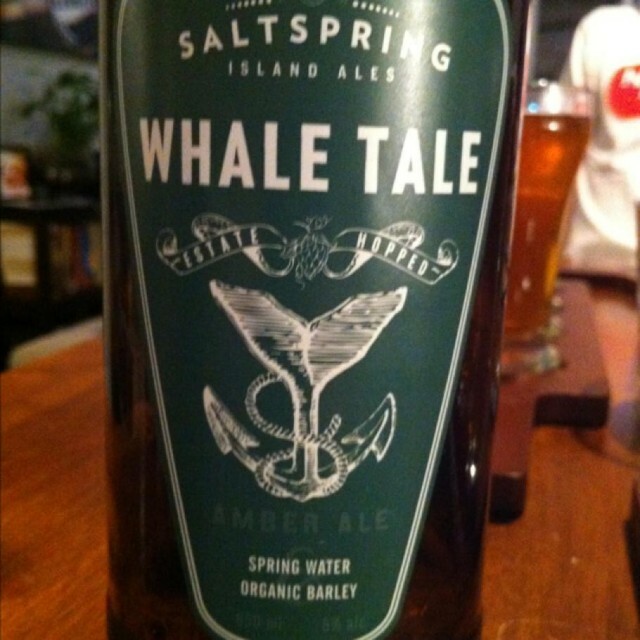 Next up is their Whale Tale Amber ale, which was similarly good, and much like the rest, light and smooth. However, this ale is decidedly more complex than the others. For example, the malts are gentle and slightly sweet, delivering notes of caramel, toffee and sweet bread, and the hop profile provides a combination of slight bitterness and citrus along with a dry hop flavor that is more varied. Apparently, this is the brew masters favorite, which frankly seems like a likely story! And that concludes this two-fer! 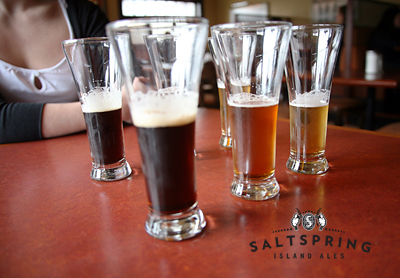 I do believe this constitutes the entire lineup of Salt Spring Island Ales, though I must admit, I don’t seem to have provided a review for their Fireside Ale or their Porter. Guess I’ve have to remedy that, and soon! Why, their Fireside is a Winter Warmer after all, and that seems like something I’d want to include in this years winter series! Back to the beer store it is! For some time, I’ve been generally lauding Mill St. for its creative endeavors. Their Tank House Pale Ale is one of the best I’ve ever had, and with few exceptions, their lineup is pretty impressive. And when it comes to barley wine, they release an annual batch that is contained in a ceramic, half-liter container and is very strong. This year’s comes in a black container and weighs in at a hefty 11.5 % alc/vol. All in all, this beer was quite strong and I fear, somewhat overpowering. This is not so much a factor in alcohol content as taste, where the powerful, extra strong malt character leads to a coarse quality which pushes just about everything else to the side. The trace hops and sweetness are quite appealing, but they tend to get overshadowed, which is too bad. Still, this was a highly pleasurable beer and definitely a worthy addition to my winter lineup. And even though a single bottle can run you in excess of 20 dollars, I consider it a worthy investment. As February gives way to March, we in the beer snob community bid adieu to the winter brewing season and prepare for the spring lineup. 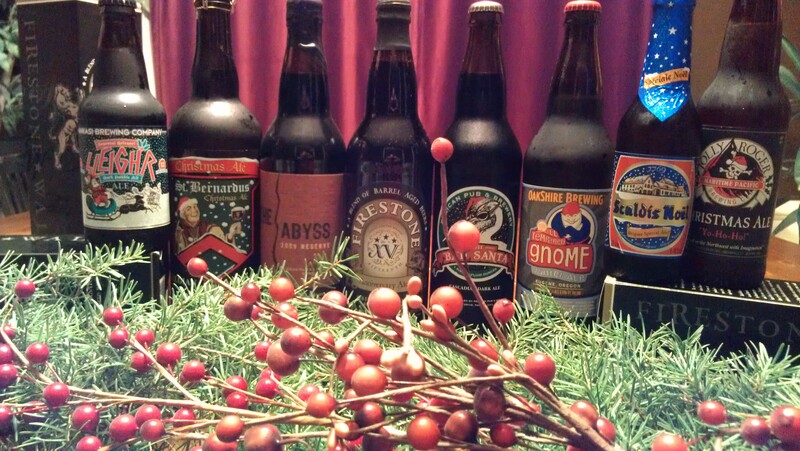 And I have to admit, 2012/13 was a pretty interesting year for winter brewing. Some creative, questionable, and classic things were created and I feel like taking stock. From barley wine to barrel-aged, from Belgian darks to bocks and trappists. There was plenty to choose from and all of it enjoyable. Of course, I would be lying if I said I got to try everything I wanted to, and there are still a few I want to squeeze in before the winter is over. But overall, I’m pretty pleased with the range of samples I got to try and think that it constituted a pretty good range of styles, be they regional or historical. From the Pacific Northwest to Central and Western European, from the medieval to the modern. Perhaps it’s was simply to get a well-rounded list with 25 candidates, but the last three are ones I know I have access to and really want to try before it’s too late. And once I’ve finished with them, I will rate which one I enjoyed the most. The winner for the brewing season of 2012/13! 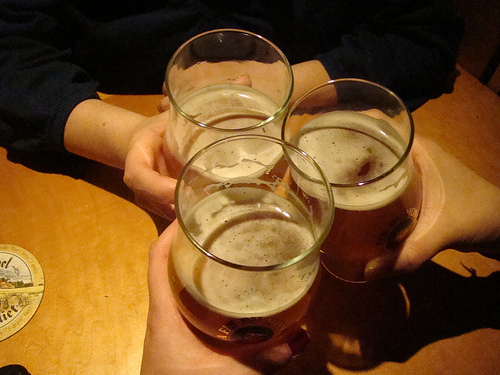 Cheers, and here’s to the ongoing and venerated tradition of seasonal brewing! Hey beer drinker! As I might have mentioned in my last post, I finally decided to take the plunge on this whole barrel-aged beer trend. Yes, it seems that brewers in the South Island region are determined to turn the 2012/13 winter season into a time of bourbon-infused beer. So who am I withhold my opinions? As expected, OBD builds on last years barley wine by adding some discernible notes of bourbon whiskey. But interestingly enough, its slightly weaker than its predecessor, being 11.8% alc/vol rather than a full on 12. Hence, the only real reason Driftwood chose to perform this little crossover was to add a layer to the flavor and present a smokier, peatier, more complex palate. 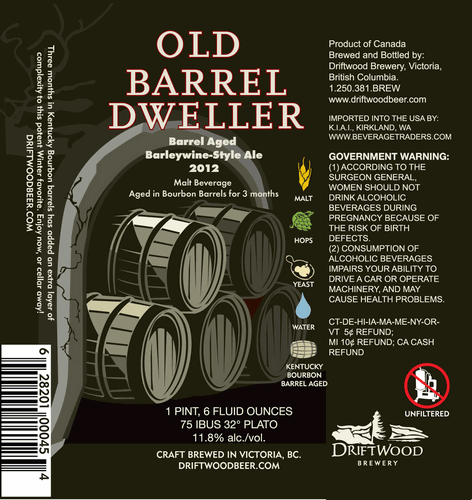 Granted, I did not enjoy this beer as much as I did its predecessor – Old Cellar Dweller. Much like Trainwreck, I feel a barley wine has no business crossing paths with bourbon! And yet, I approve of this one far more than anything else produced this season. For one, it managed to merge the bourbon infused flavor without overpowering the barley wine base. But make no mistake, I still say the two are better off on their own! Next season, more barley wine, less bourbon! 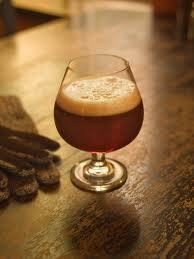 My oh my, this winter has certainly seem it’s fair share of oak barrel-aged ales, hasn’t it? 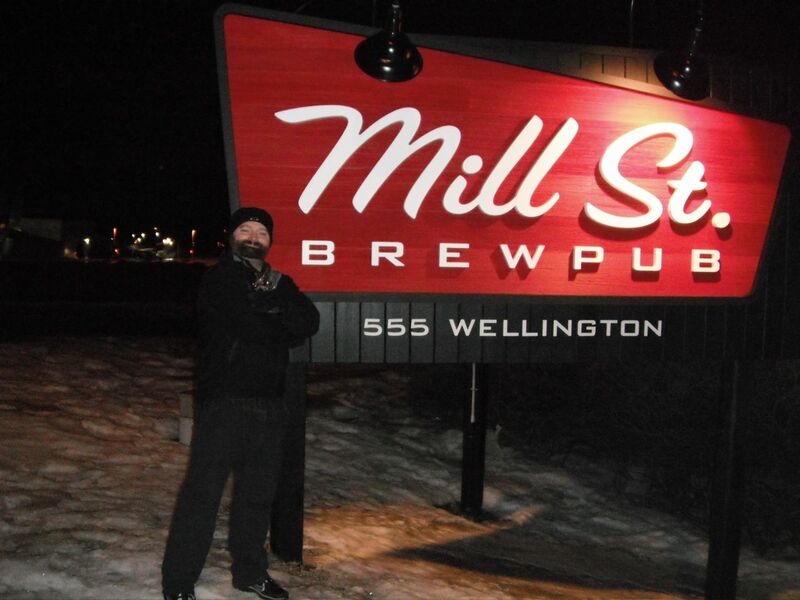 From barrel-aged barley wines to bourbon infused stouts, and embracing just about every brewery in the South Island and Lower Mainland, it seems no craft brewer in the region has been immune to this trend. Well, I’ve been holding back long enough and decided it was about time I get over my initial misgiving with this trend and really (I apologize in advance!) jump in that barrel. And after a visit to one of my many watering holes, I picked up a few bottles. 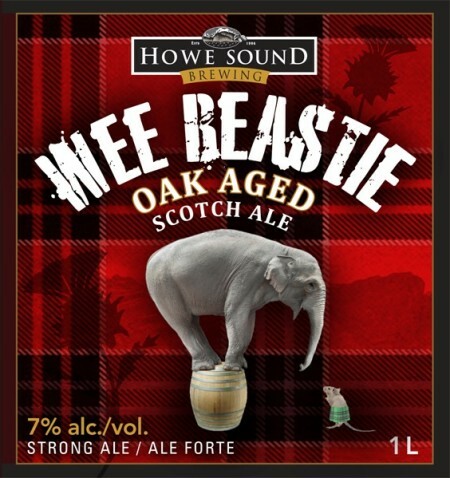 Of particular interest was this latest release from Howe Sound, the Wee Beastie Oak Aged Scotch Ale. Released in honor of Robbie Burns Day (note the veiled reference to the poem To A Mouse on the label), this beer has also made it into the 2013 winter lineup of beers that are aged in oak barrels to achieve a deeper, more complex flavor. And as usual, I was not a huge fan, but was forced to acknowledge the creative and authentic character of the end result. Yes, I’ve never been a huge fan of smoke beer, which makes an ale aged in whiskey barrels less than appealing in my opinion. What’s more, wee heavies have a history of not quite agreeing with me, mainly because the palate they achieve seems odd and unappealing to me. But that’s the thing about beer and its many, many varieties. There’s always something out there to appeal to the individual palate, and a few things that are likely to seem displeasing. And I cant criticize a genuine product, especially when it’s done right!